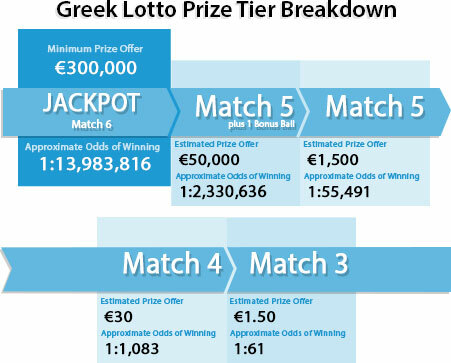 Greek Lotto is the most popular lottery in Greece. It is played in 6/49 format wherein players need to match 6 main numbers in order to win the jackpot prize. The draws are held twice a week - every Wednesdays and Saturdays evening in Greece. The jackpot prize has no cap and it rolls over every time there are no winners. During the draw, 1 bonus ball is drawn after the 6 main numbers. This bonus ball is significant to the second prize tier only where a fixed amount of €50,000 can be won. Choose 6 numbers from 1-49 or if you wish to play with random numbers, you can click “Lucky Pick”. Choose your draw days. Play for Wednesday or Saturday draw or you can also play for both draw days. Select your playing weeks. You can choose to play for the upcoming draw or opt to play for multiple future draws. Once the draw has taken place and the prize breakdown has been officially announced, OneLotto will publish and upload the results onto our website. We will also send out a full result email to all participating players.